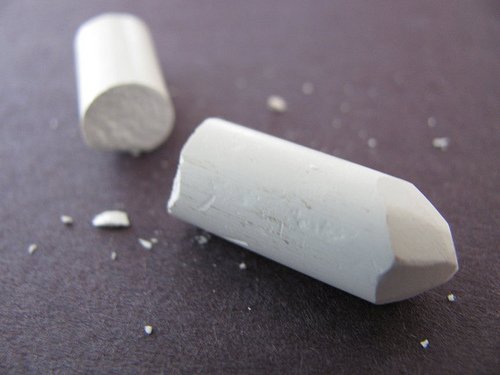 This is the story of how my professor threw chalk at me. During my second year of undergraduate studies, I took a Philosophy of Mind class that started at 8:30am. I’m far from what you would call a “morning person,” but that was the year I was steadfastly increasing my love affair with cognitive science and philosophical study of consciousness. Indeed, I was planning to pursue my Honors Thesis on that topic, tying together strands of the philosophy of science, technological expertise, and consciousness (I ended up writing my thesis on the consciousness and the Great Apes). I enjoyed this class thoroughly, got wrapped up on the course units, and was challenged by the final essay assignment. Time after class frequently was spent in the student center, drinking coffee and chatting with fellow classmates over the readings and our thoughts. It was not a difficult class for me because of the materials or conversations. It was difficult, however, because my professor had a thick Australian accent and a drawl that made listening to him without lip-reading incredibly difficult. Even at 8:30 in the morning, I would exert my energy lip-reading his lectures and paying close attention. When I turned away to write my notes or questions, I essentially stopped “listening,” quickly scribbling so I could then look up and pay attention once again. I sat in the front, as I always do, to hear better, communicate better. In this class, sitting in the front also made me a target. This professor called on me at every class, multiple times during the course of two hours. Usually I had no problem answering his question, but there were several occasions I could barely understand his question quickly, quietly, mumbled, “I don’t know.” Once, wanting to use my name as an example for a philosophy argument, he asked me, “What is your name?”—repeating this question four times still could not force my brain to comprehend his words. His reply to my sudden realization of his question prompted a chuckle and a snide remark: “Well perhaps, you should come to class more awake and pay attention.” I raised my eyebrows and looked around the classroom, where three other students were dozing away on their desks. A week after this incident, I was determined to pay attention and avoid another embarrassing situation. Once again, I devoted all my energy to lip-reading the lecture, turning away to write my notes. It was during one of those moments I turned away to write that I felt something hit my leg, hard enough to jolt me out of my desk. I had no idea what happened until I saw this object on the floor, and my professor’s exasperated expression. He had been calling my name several times, with no response—to get my attention, he decided to throw his chalk at me. Needless to say, I was shocked. I don’t think my classmates knew what happened, as I pretended I only got up to go to the washroom, where tears suddenly flowed. Did that just happen? After class, I told my peers what had happened, and they all advised me to tell the professor about my hearing loss. They insisted I demand an apology. I went to his office hours with the full intention of doing so, but at the end, I couldn’t do it. We ended up chatting about my essay instead. With hindsight, perhaps I should have. But I didn’t. I was a shy undergraduate student and I didn’t want to make him feel bad. I blamed myself instead, adding this event to a long list of incidents throughout my life in which I failed to listen and was criticized for being a stupid girl. I’ve been criticized a lot during my scholarly career. There was my high school teachers who judged me on the way I dressed and perceived me as frivolous until they graded my assignments. The French teacher who kicked me out of his classroom because he found my outfit too sexually appealing. The biology teacher who told me my flirting was limiting my potential. The professors who said my writing was worse than an undergraduate, that my speech and writing required ESL assistance, that I was not capable of doing archival research, that I was too ditzy, too stupid, too irrelevant, to amount to a scholar. And the professor who threw chalk at me. There was good things too. The English teacher who encouraged me to write and submitted my work for Young Writers Competitions. The History teacher who called my mom and demanded her to remove me from this inner city high school and place me into a gifted program. The professors who advised me, chatted with me, answered my questions and encouraged me to pursue graduate studies. The professor who listened to my request for a teaching appointment so I could figure out whether my hearing loss would limit my teaching. The professors I learned under who became friends. I’m not writing this post to complain about these people. I’ve carried these experiences as lessons to be learnt. Ways to improve myself from the days I spent as a young child blindfolding myself or closing my eyes to exercise my interactions with sounds through my ears rather than through my eyes. With enough of these experience pile up, I become aware of my positions in the soundscape of a cacophonous and overwhelming society. How I interact with these sounds plays out in how I manage my positions. I sat in the front as so sounds behind me would hit the back of my head and keep my focus on the sounds in front of me. In large lecture halls, I approach students asking questions as not to miss out or be confused by their words. Turning away to write down notes temporarily removes me from the sounds in a classroom. It’s a pause for me, but in an aural society, it’s a form of detachment where I’ve become perceived as refusing to listen. I’ve found sounds—and by extension, my listening—is closely tied with the space I’m in. I cannot tell you how many times I’ve walked in a busy mall or street with another person and “readjusted” myself to the left side of the person so I could listen with my right ear (my stronger ear). This semester, I taught a class where I had tremendous difficulty in hearing the students and relied more on lip-reading than hearing. It was not until I visited a classroom at Rochester Institute of Technology where I was giving a guest lecture, when I became aware of how classroom architecture can impact listening, learning, and engagement. This classroom was brightly lit, nearly soundproof from external noises, and without the incessant buzzing of fluorescent lights, overhead projectors, or outside traffic din. Students desks were neatly aligned so that while standing in front of the room, I could hear and see all of them. The professor who invited me for the guest lecturer told me that students, who were a mix of deaf, hard-of-hearing, and hearing, usually rearrange themselves so that they’re sitting against the walls of the class, facing each other to communicate and engage better. I was marvelled at this. My own classroom was poorly lit, messy, and constantly drowned out by several noises that irritated me and prevented proper engagement with the students. At first I thought my digital hearing aids prevented me from hearing the students well, but when speaking with them in the hallway, I had no problems. Soundscape and architecture, I find, helps us to understand the interactions of people with hearing loss in an incredibly aural society. Being aware of these spaces, I hope, will allow me to fit more into this aurality…and receive the courage to speak out next time someone dares to throw chalk at me. Thank you for sharing a few experiences. I will keep the “soundscapes and architecture” when I am working and interacting with deaf and hard of hearing people.